Some Flavored E-Cigarettes Can Cause Fatal "Popcorn Lung"
Urgent regulatory action is being called for by a group of Harvard University scientists who have found that lung-destroying chemicals are commonplace in e-cigarettes, even if the label says otherwise. The chemical in question is called “diacetyl“. It is a substance that occurs naturally in butter and is responsible for the signature buttery taste. Although diacetyl is commonly used in food flavoring and is harmless when ingested, inhalation can cause a potentially lethal lung disease. This is because, when inhaled, diacetyl can destroy the smaller airways of the lung and create a buildup of scar tissue capable of blocking airflow and suffocating patients. It is a condition called “bronchiolitis obliterans” or “popcorn worker’s disease” (this is because it was first discovered in workers dealing with artificial butter flavoring at a microwave popcorn factory). The Harvard team looked at 51 different brands of e-cigarettes or vaping liquids; it included a selection of leading manufacturers and flavors, especially fruit or candy-like flavors meant to appeal to youth. The fluids were then aerosolized and the resulting vapor (which would be inhaled by the user) was captured and tested. Diacetyl was detected in 39 of the flavors while two “chemical cousins” of diacetyl were found in 23 of the samples. The cousins, called 2,3-pentanedione and acetoin, are just as toxic to the lungs when inhaled. These findings come on the heels of an October investigation by the Milwaukee Journal Sentinel that found some manufacturers were falsely labeling their products diacetyl-free. There are currently no regulations or standards on how e-liquid manufacturers must test their products. Any testing that is performed is done at the company’s own initiative, usually for marketing purposes. 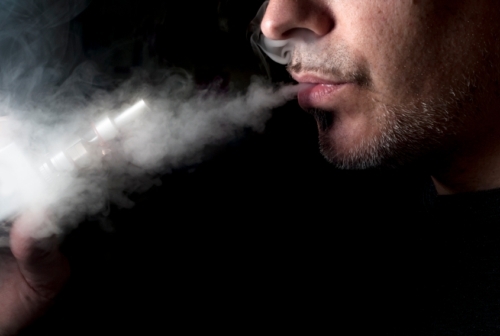 E-cigarettes are most popular among recovering smokers (due to the nicotine content) or youth (due to the flavors). A 2009 attempt by the FDA to regulate the industry failed and a new effort is currently ongoing. The Harvard team urges that any discussion of e-cigarette risks need to take flavored brands into account. There have been several isolated reports in the past few months of people suffering lung injury or disease after using e-cigarettes, although so far there have been no reported cases of popcorn lung. The research into this matter is still ongoing and it is unknown how much those who use flavored e-cigarette products are at risk. Allen, J., et. al., “Flavoring Chemicals in E-Cigarettes: Diacetyl, 2,3-Pentanedione, and Acetoin in a Sample of 51 Products, Including Fruit-, Candy-, and Cocktail-Flavored E-Cigarettes,” Environmental Health Perspectives, 2015; doi:10.1289/ehp.1510185, http://ehp.niehs.nih.gov/15-10185/. “Chemicals Linked with Severe Respiratory Disease Found in Common E-cigarette Flavors,” Harvard School of Public Health, December 8, 2015; http://www.hsph.harvard.edu/news/press-releases/e-cigarette-flavoring-chemicals-linked-to-respiratory-disease/. Rutledge, R., “Vaping Linked to Dangerous Chemicals, Harvard Study Confirms,” Toronto Star web site, December 9, 2015; http://www.thestar.com/life/health_wellness/2015/12/09/vaping-linked-to-dangerous-chemicals-harvard-study-confirms.html.